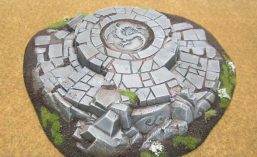 Ral Partha Europe | Azazel's Bitz Box. The next Orc off the rank is this guy. A Kev Adams sculpt from shortly after he left GW, and originally from Heartbreaker in the 1990’s (when I purchased it), this figure is still available today from RPE/Ral Partha Europe as “2004 Orc w/scimitar” for a very reasonable 2 quid. I’ve painted him with quite dark skin, though he’s nowhere near the size of a Black Orc. It’s a fairly simple paint job that gives him a little bit of individuality compared to the Citadel models I’ve been painting lately while being similar enough for him to fit in wherever I need to drop him down. It’s a simple figure, all in all – but I think it’s a cracking sculpt that doesn’t need to reply on the character of old-school models, nostalgia or the act of painting it to endear it. Those things all add to this model, but I think it stands confidently on its own even without those additional elements. Here’s a model I apparently completed last year. I figured this out because I just found the photos dated 4th July, 2015 in my “Orcs” folder. 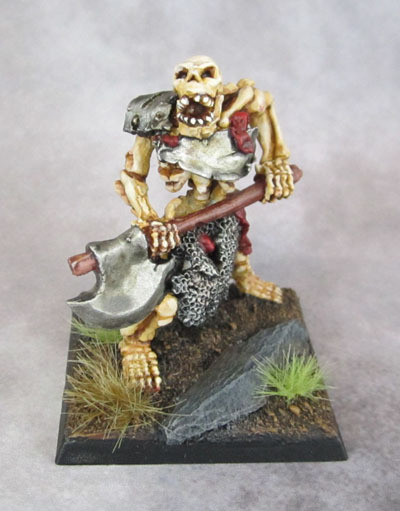 I purchased this model back in the 1990’s, left it to sit in a box for a decade or so, and then started it – only to leave it in that part-painted limbo for a few further years. Given that it was completed last year in May-June, it would have been one of the initial models that led me to my “finish things off” push of the second half of 2015. Back int he day it was a Heartbreaker model, from the people who brought you WarZone 1st and 2nd edition. 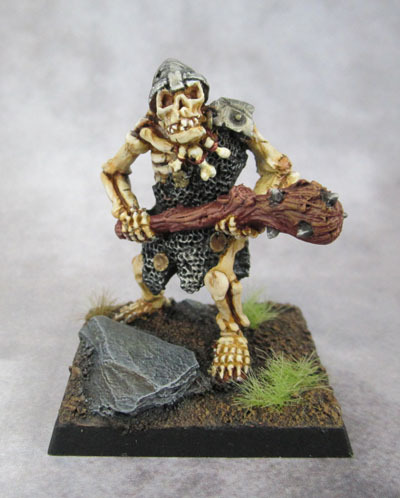 These days the model is owned or licenced by Ral Partha Europe, who prefer to be called RPE since they now have little to nothing to do with the original Ral Partha. Thankfully, we can safely ignore the convoluted backstory and still simply and easily just buy the model if we’re interested, along with its brethren. And no, I’m not affiliated or reimbursed by RPE – or anyone else for that matter! The yellow and black dag pattern is something that dates the model as well. I probably wouldn’t do the same these days, I’d keep the copper/bronze scales, but the patterned trim would probably just be done in a quick and simple cadmium red-brown. Similarly, the skulls would probably be done in a metal – either copper or steel – rather than as carved bone. I’ve moved away from painting every skull or bone I see on armour as bone. Regardless, it’s a great armoured orc figure, and I feel that it still stands up well today. The default sculpt looks quite 2D, but simply bend-rotating the axe head forward helps that aspect out a lot. 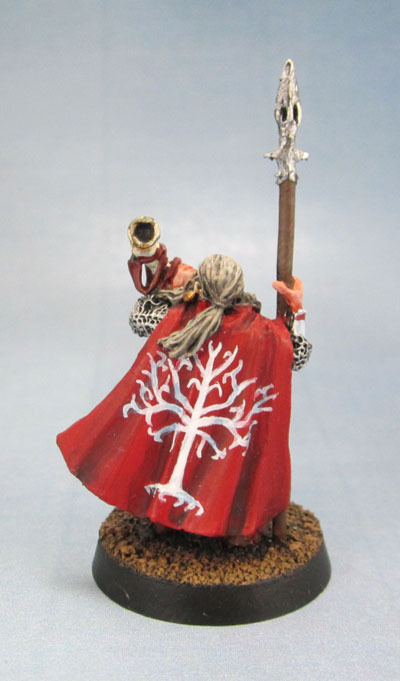 Our aim is to produce a warband of 10 dwarves in 28mm scale. 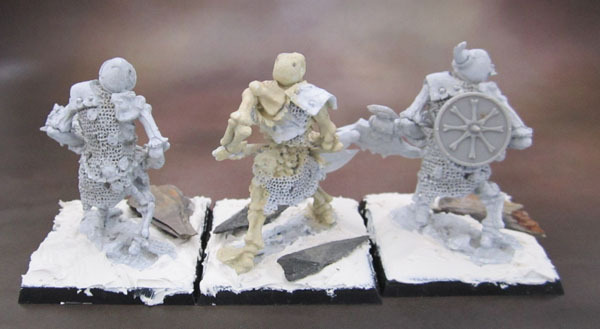 They will be sculpted in epoxy putty, moulded in black rubber and cast in metal – miniatures the old school way! 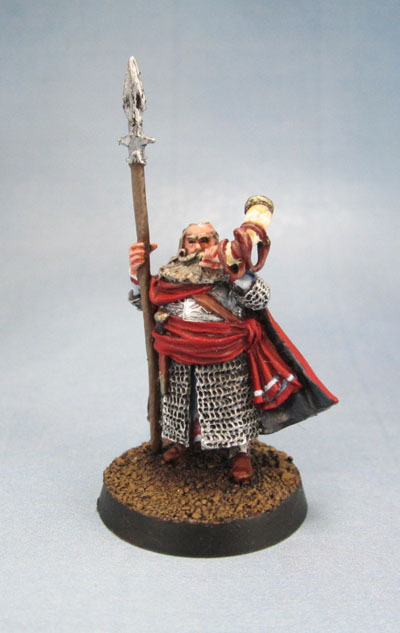 Picture the proud dwarf king in exile, forced from his mountain stronghold. Leading a band of grizzled veterans, they hire their services out, biding their time and amassing gold and followers until the day they can reclaim their homeland. You know the story, it’s the classic excuse to get a dwarf warband together, though this one needs no hobbit or human help and comes complete with its’ own dwarf wizard. Perfect for dungeon bashing and skirmish games, or with the possibility of adding duplicates to your pledge you could even build a small army. The first 5 sculpts pictured above have been mastered already, the next five will be based on these and will provide another spearman, swordsman, axeman and a pair of crossbowmen. The next sculpts are already in progress and pictures will be added as soon as we have them. They measure approx 20mm tall and scale well with other miniatures. Designed and sculpted for us by the talented hands of Mark Evans. These are the different pledge levels, only the Flagon of Ale level and above qualify for the free assassin dwarf. All pledges can add extra miniatures from the list below, each mini has a letter for ease of selection, simply increase your pledged amount by £2.50 for each additional dwarf you want. When we contact you after the kickstarter you can use these letter codes to easily confirm additions. Any miniatures or extras unlocked – will be added to this list. I’ve tended to move away from WIP and the From the Painting Desk series of posts recently, as I’ve had a fair bit of painted stuff to show. A little while ago, I placed some first/test orders with Brigade Models and Ral Partha Europe. The long and the short of it is that both companies came through nicely, but I only got around to writing up a review of my Brigade Models experience, and got distracted before finishing my RPE review. That RPE review is still in the works, but in the meantime, I wanted to put together a smaller review of some figures I picked up pretty much as impulse purchases while buying the other stuff. 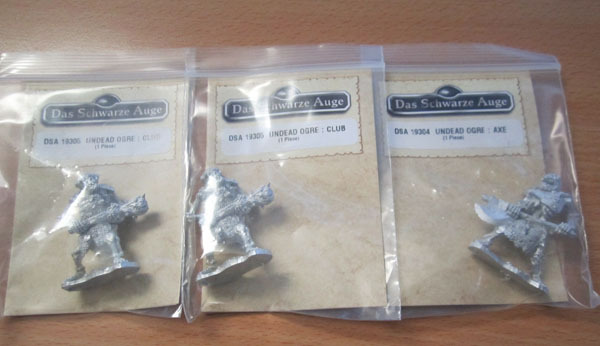 Three Das Schwarze Auge Undead Ogres, in their RPE mail order packaging. 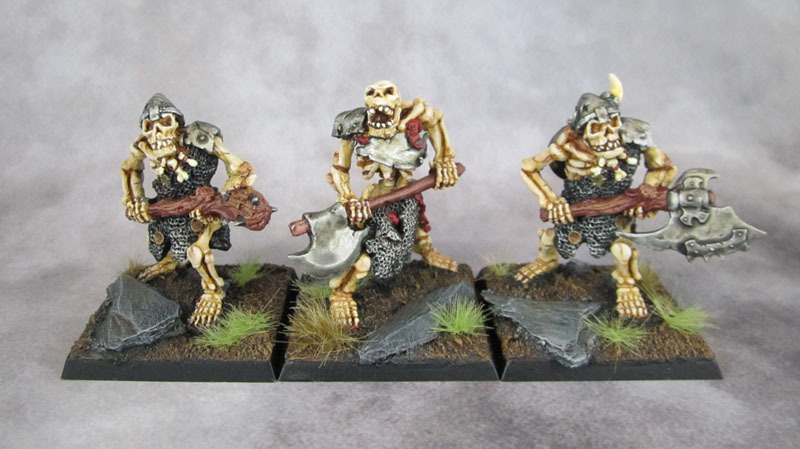 Das Schwarze Auge – Undead Ogre – Axe, and Undead Ogre – Club. I assume these are sold by RPE under licence, as they have a fair bit of licenced product. DSA (The Dark Eye) is a German RPG of some description, and I don’t care to know any more about it. What I do care about is cool models and models that have potential for my own use, so I bought a trio of them. 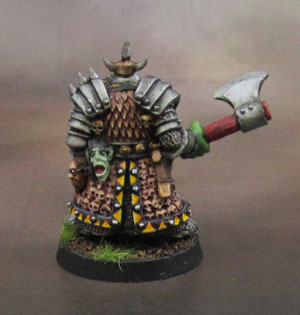 I’d have preferred if there were three distinct sculpts in order to make up a KoW unit, but beggars and choosers, so despite preferring the Axe sculpt, the club seemed to have more potential for simple conversion, so I got two of the club and one of the axe. The three castings “in hand”. Castings were reasonably clean, needing a bit of work with a scalpel to clean them up, but not bad at all. I decided to make the two clubbers distinct from one another by doing some work on both of them, to move them both ever-so-slightly away from the original sculpt in different directions. One I simply de-horned, while the other I changed the club to an Axe with the help of the head off a Mantic Ogre’s 2-handed axe, which I pinned onto the end of the cut-down club handle. To make him a little distinct from behind, I added an old Marauder Miniatures-era Undead shield to his back as well. Mounted on a 40mm base, and with a bit of putty to bring the base level with their integral metal bases, and some bits of slate to add interest and break up the flat area, and we’ve got a decent little unit of Undead Ogres (We’ll just proxy the Undead Troll rules) for Marouda’s Kings of War army in metal for only £15/AU$30. Not too bad for such a unit. 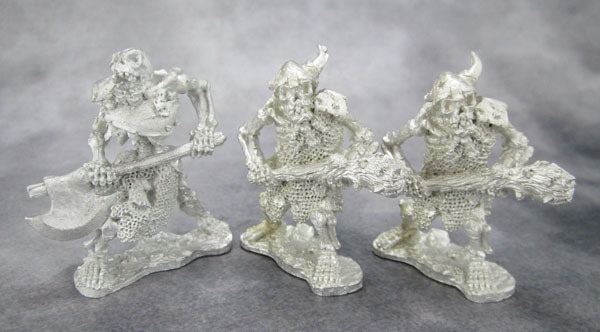 Not as cheap/model perhaps as the UK prices for Mantic’s restic or GW’s HIPS Ogres, but still cheaper than a single Metal/Finecast Ogre from GW or even a good chunk of Reaper’s metal Ogres. 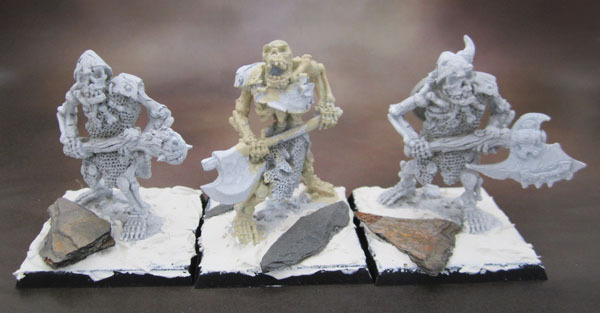 And not even Reaper (who seem to make every odd thing) make Undead Ogres. Aside from this one. Who doesn’t really count for most wargaming. 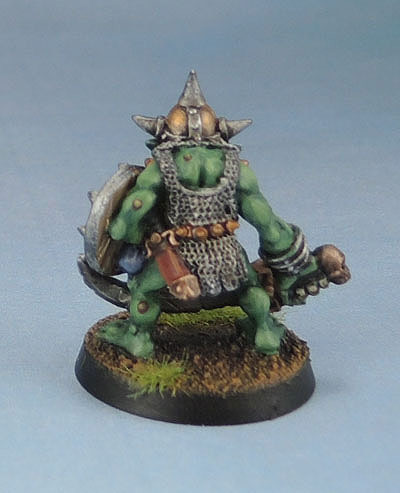 Rear view, showing the shield added to make the two identical Ogres less so. Now I just need to stay focused long enough to actually finish painting them. I’d planned to take them to work where it’s guaranteed I’d get the bone and metal done – which is how I can justify “queue-jumper” models to myself, but with the large bases added, they’re difficult to transport to work in the little cases that I favour. I buy new models and paints and such fairly regularly. Like most of us, I tend to buy from the same stores most of the time, but occasionally I’ll try a new place, and see what they’re like for one reason or another. My retail go-to for years was always Maelstrom Games, though we know how that one panned out. I tried Wayland Games a few times around then, as well as during and even after the decline of Maelstrom, but shipping was always more expensive, slower to despatch, and their customer service was seriously lacking. No links for you! Since then, my go-to retailer of choice has been Firestorm Games in Cardiff, Wales. Friendly and efficient service, a 10% discount, free international shipping, and a willingness to sort things out very quickly. Orders placed are typically picked and sent out within a few hours. Great to deal with and my current #1 choice. Lately, I’ve been using Arcane Scenery and Models an awful lot. In fact, I’ve been ordering from them more frequently and in larger quantities than Firestorm, and TTT has dropped out entirely. This is because I’ve been buying more Historical stuff, for use in games like SAGA, Kings of War and (theoretically) LotR and Hail Caesar! They don’t have any discount scheme in place, but they do offer free worldwide shipping, and Steve, the (the owner?) has great service. Arcane is another retailer who has your order out the door within a couple of hours of ordering. They have possibly the world’s worst website to deal with – it’s as slow as hell and the search function is hidden on the “contact us” page, but the quality and speed of service make it worth the time it takes to navigate their site for me. This week I ordered from both Arcane and Firestorm – I often find that they make a great combo when there are things I want to buy as I can take advantage of both stores’ stock levels – and both had my stuff on its way within hours. I love it! This week, I also tried a couple of “New” retailers (to my experience). 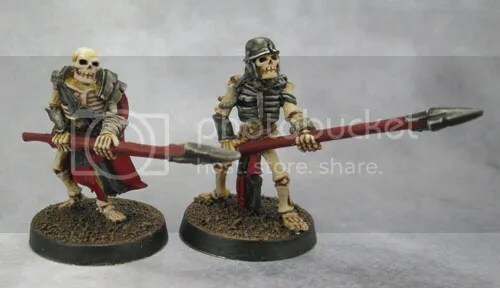 The first of the two was Brigade Models, who I tracked down recently as the current owners of those metal skeletons I picked up recently. Those Skeletons I quite liked. 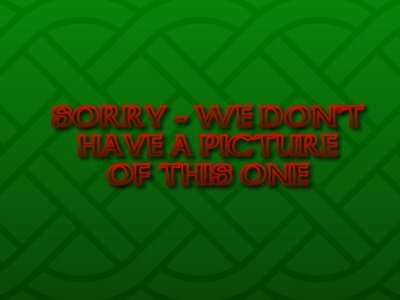 They have pretty reasonable prices for their models, though their website suffers from a bit too much of the dreaded “No Image” image. My usual response to this on almost all miniature websites selling me stuff at retail is to skip them entirely. I persevered a little and placed an order of Skeletons as well as a rules bundle for Celtos, as it was priced very fairly. 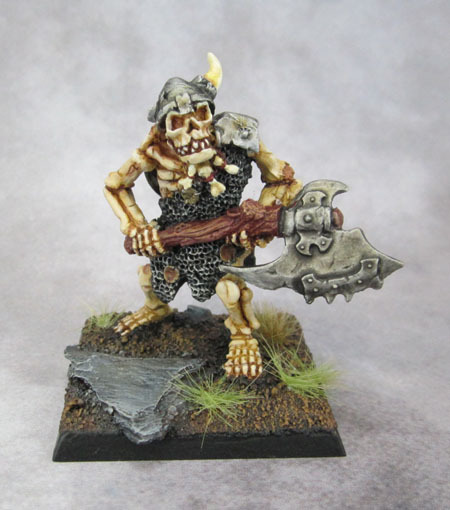 The reasons I was willing to order from these guys is because I like the specific models that I ordered (I like sturdy metal undead models) and also because they state that they remove the 20% VAT for non-EU orders, and they actually have very reasonable shipping costs. Sadly, and I guess that this is my own fault – but after ordering I saw the “despatch times” for Brigade. Brigade Models is very much a part-time business. Because we have full-time jobs, these sometimes must take priority, so bear this in mind if your order is delayed. Please allow up to four weeks (six weeks overseas) for your order to arrive. We strive to get orders turned around much faster than this – in ‘normal’ periods (ie outside of sales) 95% of orders are sent out within two weeks. However, sometimes Real Life overtakes us and it takes a little longer. If your order is particularly large or contains lots of resin items that may also affect delivery time. We can also get very busy during our sales, when we sometimes receive as many orders in a week as we do in a month ! In the case of severe delays we will send partial orders, or at least let you know about the delay. If you really, really need some items in a hurry then contact us before you place your order and we can let you know if we can ship them within your timeframe. Ouch! Up to 2 weeks to send my stuff out at best? 4-6 weeks delivery? A bit of a chance from the instant-2-day despatch and week in transit that I’m used to from UK companies. I guess I’ll see my Skeletons sometime in mid-late June. Hopefully? 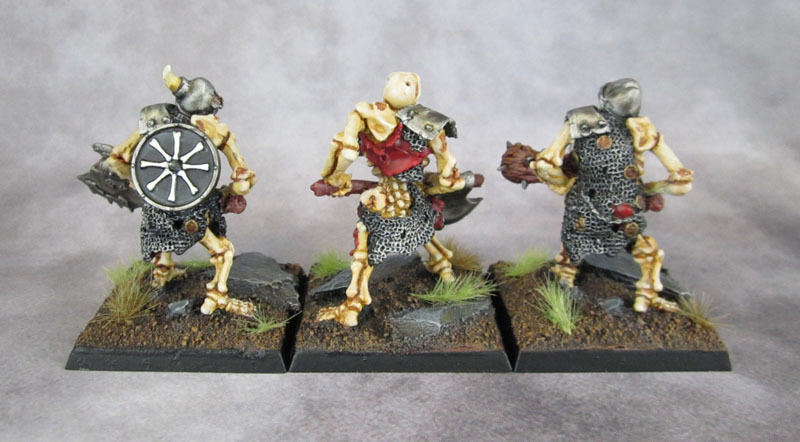 Finally, I placed an order with Ral Partha Europe – or as they tell me they’re wanting to transition to – RPE. (Time to register a couple of URLs, guys. – RPE.com and RPE.co.uk have squatters on them, though). 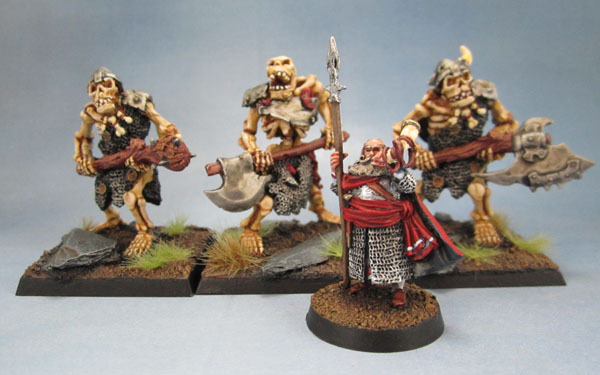 I only became aware that these guys even existed recently, initially through Goblin Aid for Kev Adams, and then a few months later when a colleague at work (who I just found out is also into wargaming) told me that he’d bought a ton of Heartbreaker Kev Adams Dwarves from Ral Partha Europe. 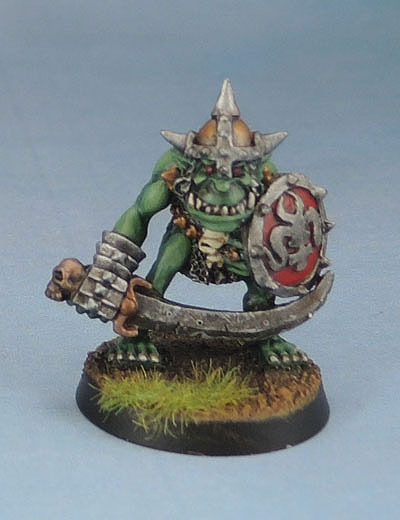 I followed up and found that they also have much of the range of Heartbreaker Kev Adams Orcs and Goblins that I’d picked up back in the 1990’s, as well as more of the Bob Olley Ogres that I’d also bought a couple of in the ’90’s. 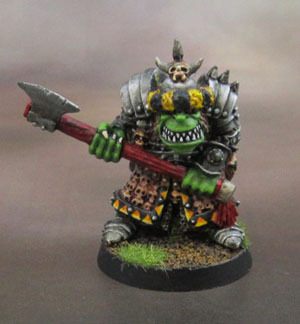 They have a nice little range, and so I added quite a few things to the bunch of Ogres that I’d come to the site for. I had quite a nice chat on the phone with (I believe) Martin who was pleasant and friendly to talk to, and answered a few questions I had. Encouragingly, they say that they charge actual postage and also that they will (manually) refund VAT for non-UK customers. “If you pay by Paypal and are from a non EU country we will refund the VAT on orders over £10 in value, before discount and not including postage cost.” They also say that orders are usually posted within a week, and please to allow 28 days for delivery before worrying. Basically, I’m happy to pay actual shipping OR VAT to UK retailers, since the VAT comes to 20% anyway which goes towards shipping. I’m NOT willing to play with places that have those horrible 1980’s-1990’s style “add 20%/25% of the total for shipping” – and even worse are the ones who do that and then keep the 20% VAT on top. So, at this point I ordered from both Brigade and RPE on Wednesday night (my time) which is around Noon in the UK. I haven’t heard anything from either yet, the time of writing being late Sunday afternoon my time. I did get a newsletter from RPE yesterday touting their new releases and also mentioning that they had electricians in for most of last week, so had to put regular business on hold for a few days – fair enough. I guess we’ll see how this one pans out as well! I’ll keep these two updated!